While some companies are still arguing about what constitutes a return on investment for social media, others are forging ahead with social business models. Never mind that there isn't a definitive definition. What has been worked out, according to the 2012 FedEx Ketchum Social Business Study, are the elements that it will include. Everything else that a social business might be is a work in progress. Key elements of a social business model from the study. • A non-linear flow of information between the organization and internal/external stakeholders. • Input that drives the decision making, business processes, organizational structure, and innovation. • The flexibility to listen and adapt to shifting marketplace opportunities in real time. • Distribution of the ownership of social media tools across a broader set of internal stakeholders. Simply put, a social business model aims to employ social media as it has been by a few companies even before social networks became prominent. The general idea is to move away from the notion that social media is merely marketing but rather an engaged dialogue that leads to transformative change in every area of operation. It presents one of the greatest opportunities and threats to business long term. In essence, what people are calling the next wave of adoption is really what many people realized social media was meant to be. It's not merely about the amplification of what the company wants to tell people, but rather a vested interest in increasing the company's intelligence by removing silos and including the customer as an active participant as opposed to connecting with them exclusively at the point of purchase and when there are problems. In theory, it sounds close to perfection. But there are some concerns. According to the study, companies are still concerned about employee privacy, content ownership, legal/compliance issues, and the inability to correct misinformation that appears on the web. Some of issues are more valid than others. What are valid concerns? What are not? What's being missed? • Employee Privacy. Social media has a tendency to both expose individuals (strangers want to "be friends" with the business contact) and tend to associate people with the company brand (even during off hours and even when they leave a company). It's a semi-valid concern because employees haven't adapted to the new environment. Mostly, people want to selectively be associated with their companies. • Content Ownership. The general concern is that when employees generate a high level of interest and develop their own online networks, they tend to take those networks with them even though their association with the company had a hand in developing those connections. Although it's a risk, it's largely invalid because it's a risk that companies have faced long before social media. When people move, so does some intellectual property and so do some customers. • Legal/Compliance. The legal/compliance issues are largely invalid, trumped up by some executives who never wanted to have the social media conversation. The reality is that as environments change so does the governance of legal/compliance issues. Many government agencies are even encouraging companies to communicate more, not less. • Misinformation. While the Internet has some growing up to do in terms of understanding credibility, concerns over misinformation are largely invalid because it's not a new threat. If anything, more sources of information on places such as the net can better protect a company than the fewer sources that used to exist. More and more, people check four or more sources of information before making decisions. Ergo, they know misinformation might exist. • Improper Vetting. This is the concern that ought to be on the radar, but generally isn't. Just because you increase the size of your input pool doesn't always mean you increase the size of its intelligence. Or, in other words, customers aren't always right and crowd-sourcing runs an equal chance of becoming done by committee. In fact, crowd-sourcing may have killed touch screens on the front end. Thank goodness companies didn't listen until people had the opportunity to change their minds. • Shutter Clearance. Sometimes companies really don't want everything on the table. It's not for any malicious reason as some people like to argue. Judgements made on half-baked ideas don't necessarily make for better products. For example, I can't imagine what someone might have thought watching me write a first draft. Sometimes we all need some breathing room to think and fully realize something. At the organizational level, this might translate into fewer not more people having a big picture view. 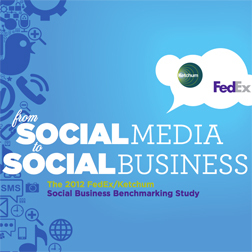 The 2012 FedEx Ketchum Social Business Study is worth a look. All in all, the 2012 FedEx Ketchum Social Business Study makes for an excellent primer. The highlights I mentioned above only scratch of the surface of the content that can be mined there. Sure, I think the buzz term "social business" is trumped up as if these things never existed (being a "social business" is what convinced Corning to make specialty glass for iPhones), but what might be different is that some of it is more likely to play out in public. That said, no matter what you think you know or feel about social business models, it's in your best interest to pay attention to what is being produced, created, and innovated as a result. This study, specifically, makes an excellent primer. Marketing Choices: Does The Customer Come First? Marketing Affiliates: Are They Worth The Time? Branding Online: Do We Need People To Act?